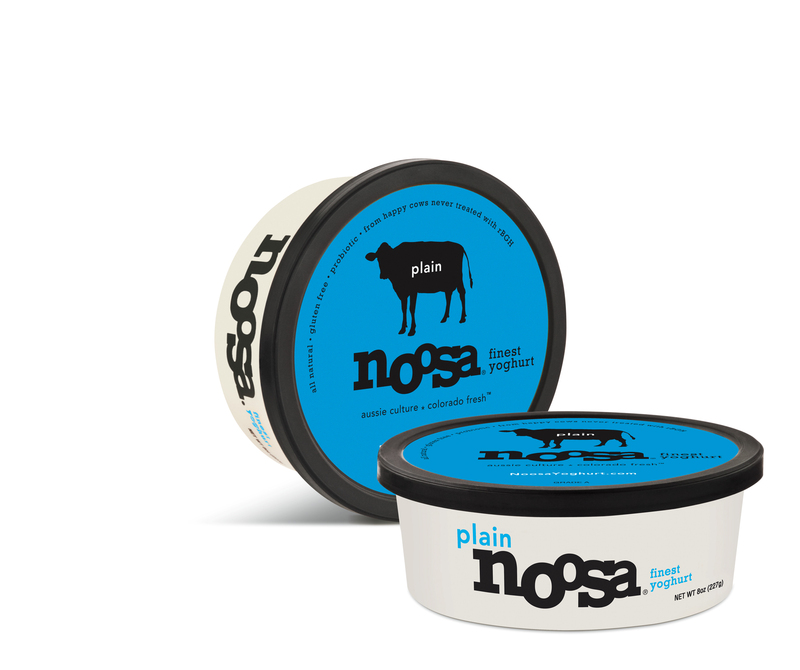 IFBC and a Noosa Yoghurt Giveaway! 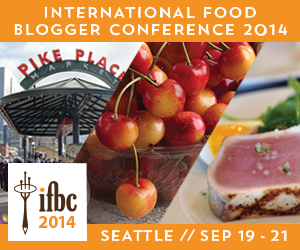 This weekend I will be surrounded by hundreds of other people who love talking about food just as much as I do – I am so excited to attend the International Food Blogger Conference (IFBC) again this year, being held right here in my lovely hometown of Seattle! 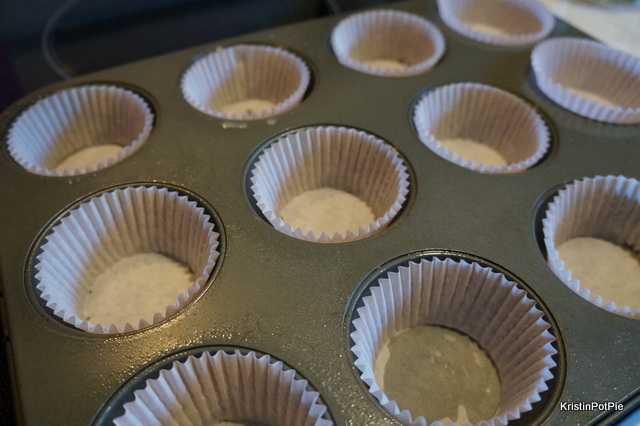 While I prepare myself to answer the one question I always get when I tell people the name of my blog – “So, you write about potpies?” – I am at the same time scouring the IFBC website and planning how to get the most out of the conference. Last year was my first time at a blogger conference and I have to say that I was a bit overwhelmed just taking it all in. The speakers, the sessions, the food, the networking! Not to mention the SWAG! But this year, with last year’s experience under my belt, it is much easier to make a plan and set some goals. One of which is to get out there and make more connections – connections with more bloggers I don’t know, and connections with the companies sponsoring the event. 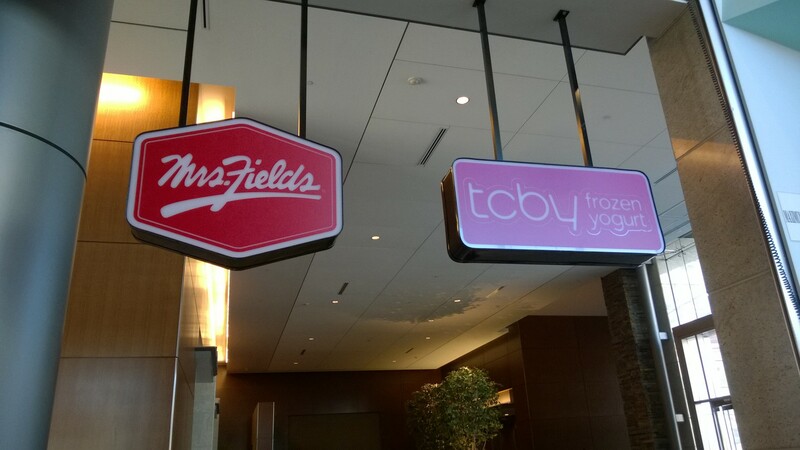 IFBC has some pretty impressive sponsors. As an event planner myself I am acutely aware of just how important sponsors are to an event and I want to make sure that they know how appreciated they are by us bloggers. And I did a double-take while perusing the IFBC website and realized (after I had already happily agreed to do the giveaway!) that Noosa Yoghurt is a sponsor for this weekend’s IFBC. What a happy coincidence! I enjoy yoghurt as part of my breakfast almost every morning (and frequently for a dessert in the evening! 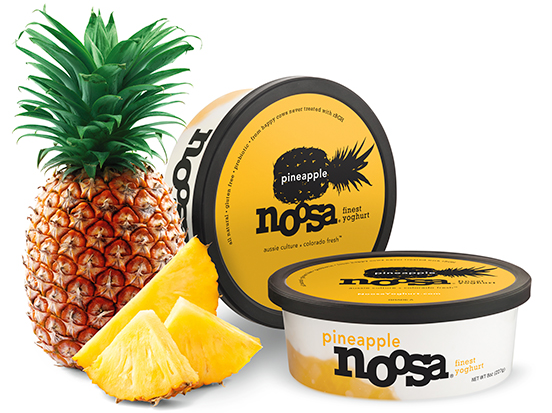 ), so I was thrilled when Noosa sent me some samples to try out the new tropical flavors (pineapple and coconut) of their Aussie style yoghurt. With a recipe that originates from Noosa, Australia and produced in Colorado, this rich and creamy yoghurt, similar to Greek yogurt, is made in small batches and infused with honey to give it a delicious sweet-tart tang, and smooth, velvety texture that sets it apart. They add just the right amount of fruit purees, made from the best the seasonal market has to offer, and pack it in clear tubs so you can see for yourself the lusciousness of what you’re about to enjoy. 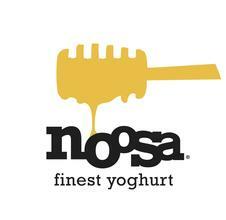 Noosa Finest Yoghurt is free of artificial ingredients of any kind and made using Morning Fresh milk which is free of artificial growth hormones (rBGH) and artificial preservatives. Family-owned and operated since 1894, Morning Fresh is renowned for the sweet, rich, all natural milk their happy cows produce. Why are their cows so happy? All of them graze on open pasture at least 90 days per year, and the rest of the time, dine on home-grown grain, silage and alfalfa to ensure the highest quality feed without the use of harmful pesticides. Noosa is the host for our Saturday morning breakfast. 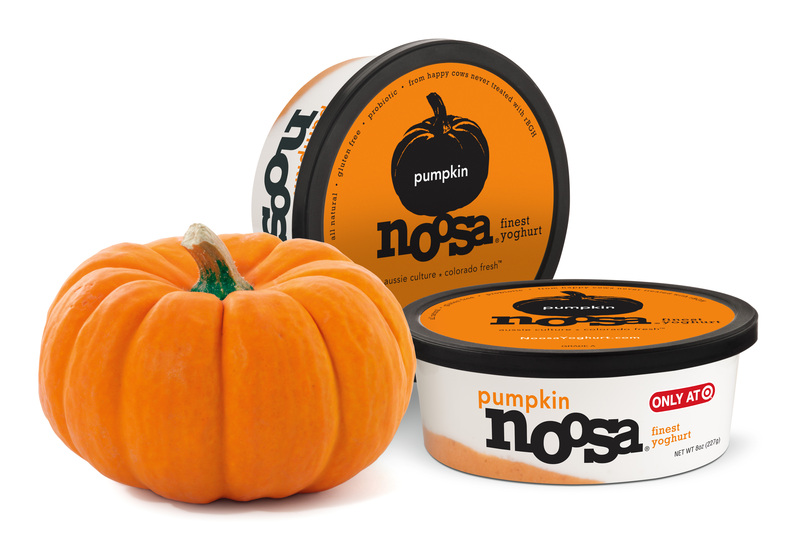 Koel Thomae, Noosa’s founder, will share with us bloggers about her start in the U.S. and how she makes her fantastic tasting yoghurt – including the new pumpkin flavor debuting just in time for fall and being officially rolled out at this weekend’s conference. 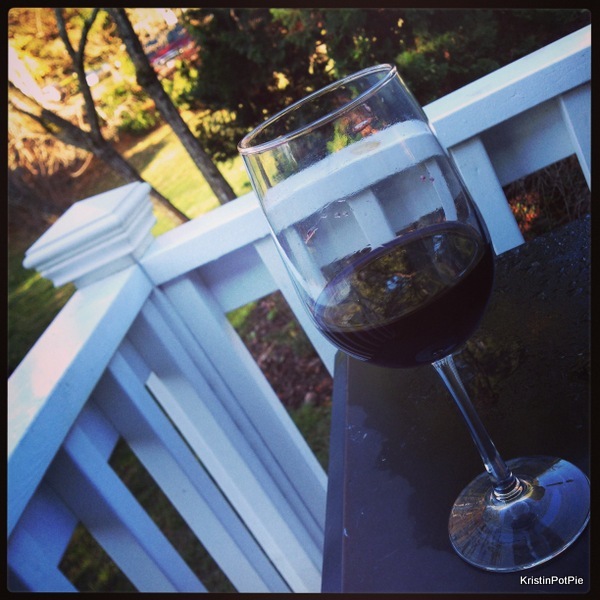 Since I can’t take you with me to the conference (and I am all about sharing!) 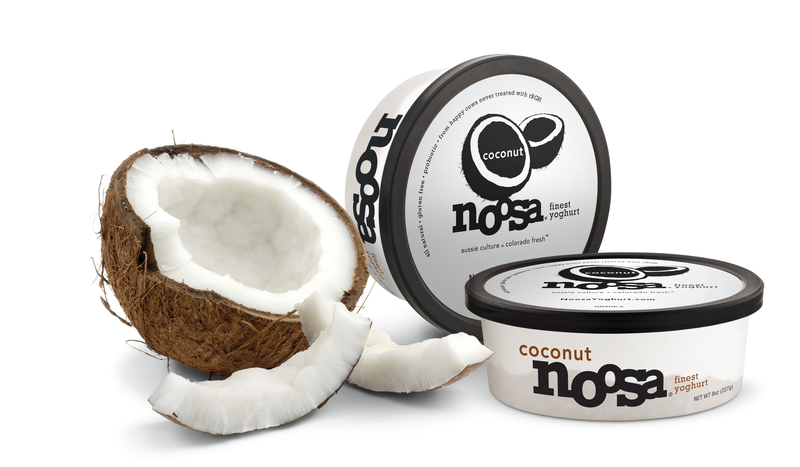 I am partnering with Noosa to give away a Noosa Finest Yoghurt 10 pack (ten – 8 oz containers) to one lucky reader so you can try it out for yourself! This giveaway will end Midnight Pacific Time, Wednesday, September 24. 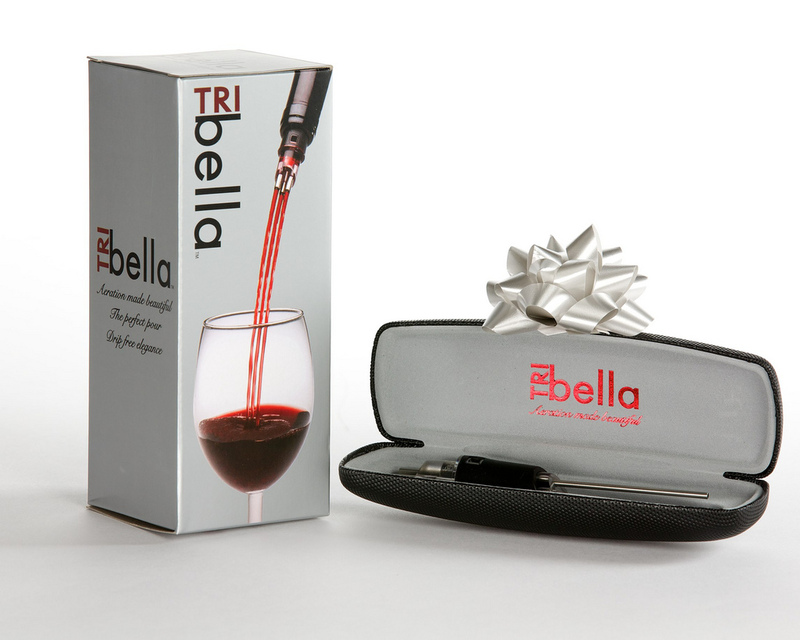 I will choose one winner from the comments on my blog Thursday morning and will email the winner. Winner will have 24 hours to respond before I choose an alternate winner. Photos used with permission of, and provided by, Noosa Finest Yoghurt. Did you know that (besides food events) adventure races are one of the hottest trend in events right now? The 7 Summits Adventure Race (7SAR) is a brand new race that was inspired by the landscape and challenges of all 7 continents. The course contains 20+ obstacles over 7 miles, with each mile transformed into a different continent. Competitors will attack multiple obstacles including Elbrus’ barbed-wire crawl, Carstensz’s Pyramid zipline flyover, and Everest’s Khumbu Ice Fall’s ladder. The race also includes an optional 3-mile course. Both races are followed by a post race Summit Feast and Celebration Party. The 7SAR is held all over the country, but on October 12th a Seattle-area race will take place at Straddleline ORV Park in McCleary, WA. You can do it! 7SAR is designed to be challenging but achievable for all athletic levels and by the end of the race, participants will have experienced a bit of what it feels like to cross each continent and summit its highest mountain peak. The nice people over at 7SAR have offered me one race entry to give away to one of my lucky readers. To enter the giveaway: Simply leave a comment telling me why you would like to participate in this race. Please note: This giveaway is open to local readers only. This giveaway will end Midnight Pacific Time, Saturday, October 5. I will choose one winner from the comments on my blog Sunday morning and will email the winner. Winner will have 24 hours to respond before I choose an alternate winner. Birthday Giveaway! 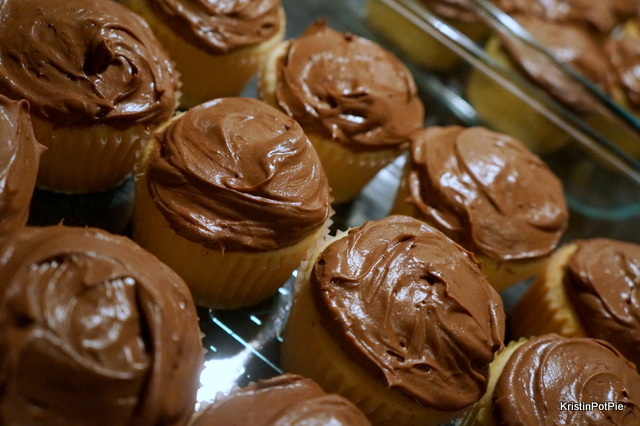 A Dozen Cupcake Royale Cupcakes! I am a bit of a traditional gal. I like hot dogs on the Fourth of July, pumpkin pie on Thanksgiving, baked ham on Easter…and cake for my birthday! But when I have cake, I want the best – and I just love to share! 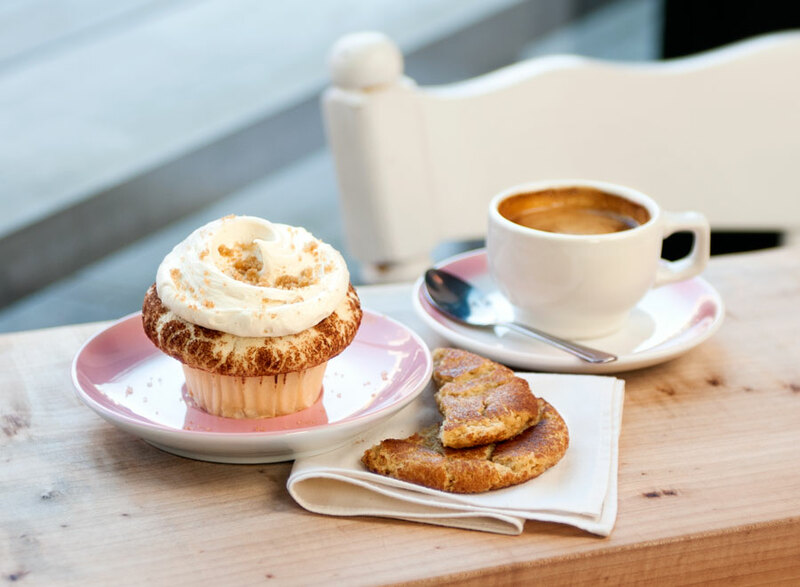 So today, I am giving you, my readers, the opportunity to win some lovely cupcakes from my favorite Seattle cupcake cafe – Cupcake Royale! 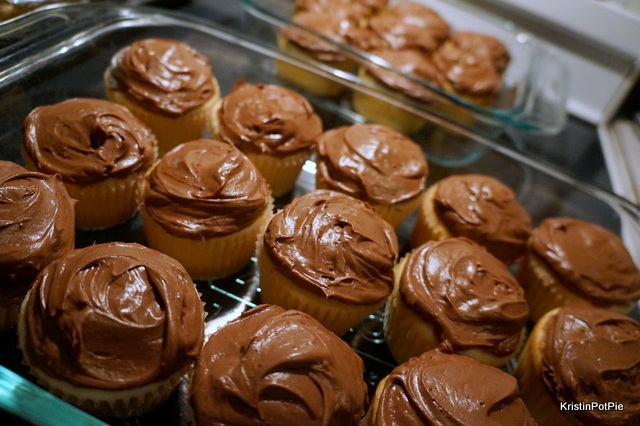 Cupcake Royale has generously offered me one dozen cupcakes to giveaway this week in honor of my birthday. 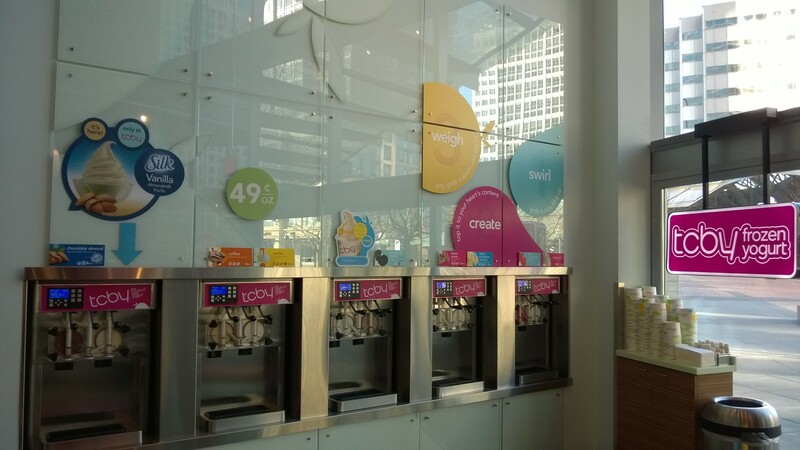 What flavor will you choose if you win? Perhaps you will want to squeeze out the little last bit of summer with their August flavor of the month – the Strawberry Shortcake. 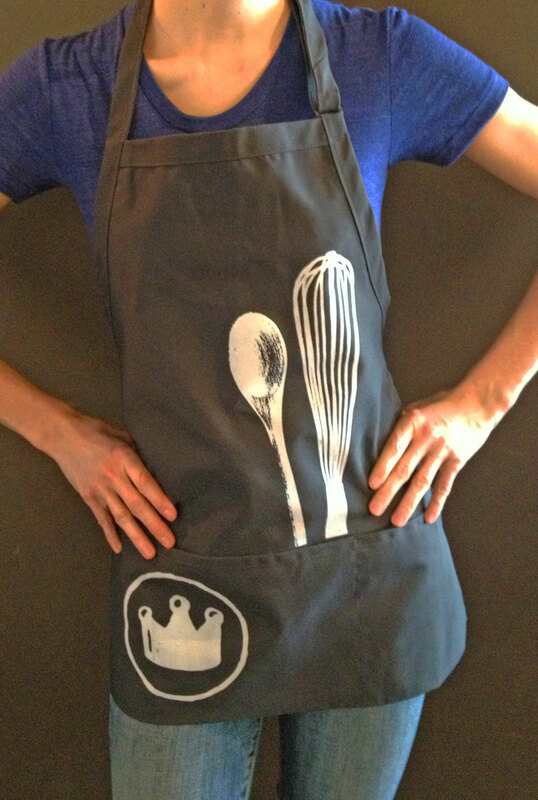 Available throughout the entire month of August, this local gal (just like me!) takes the cake. 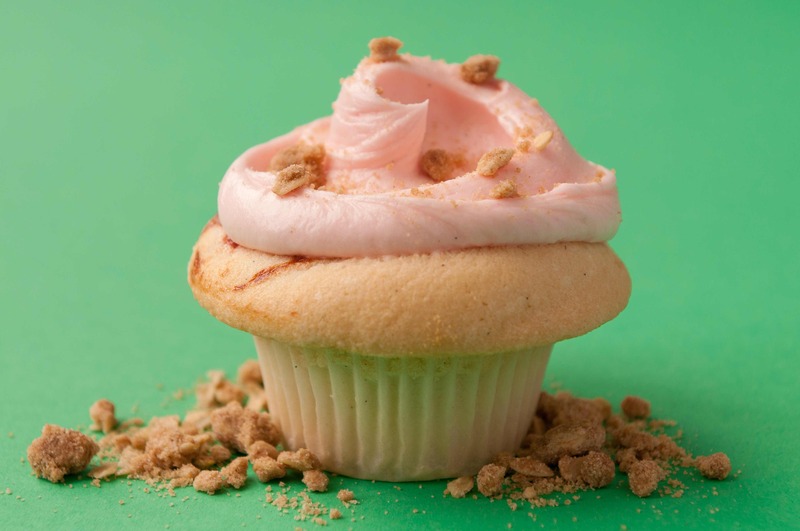 Sweet strawberry puree, vanilla butter cake and toasted graham cracker crumbs. 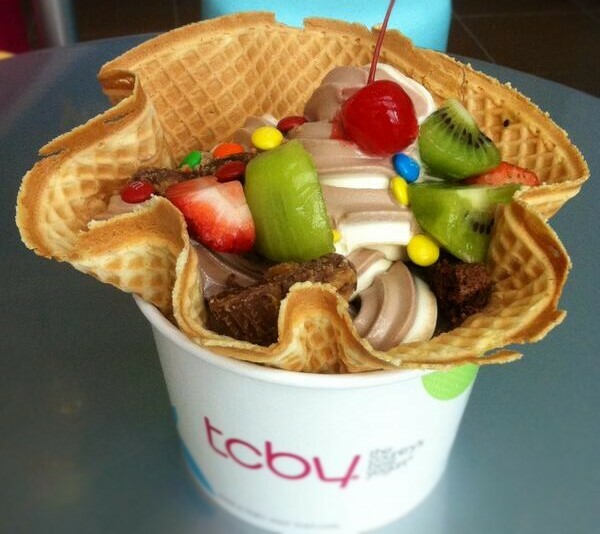 All of this and whipped cream strawberry frosting topped with even more graham cracker crumbs. 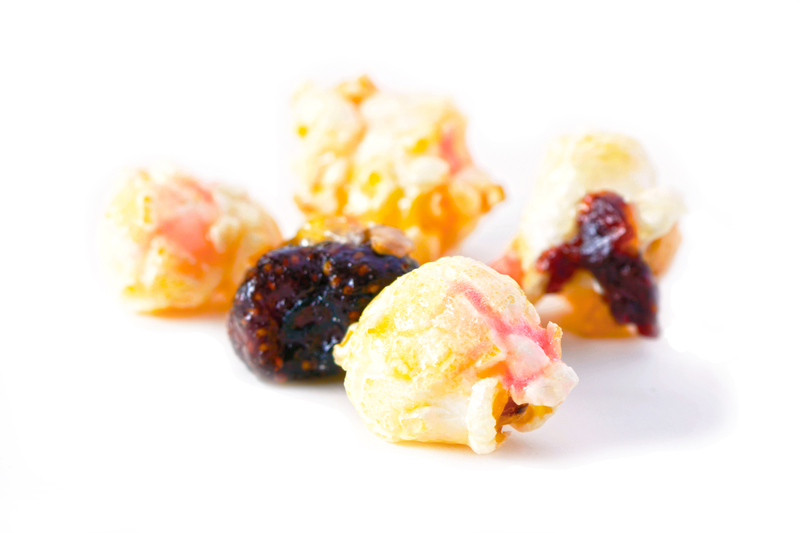 Perfectly sweet, crisp and local. 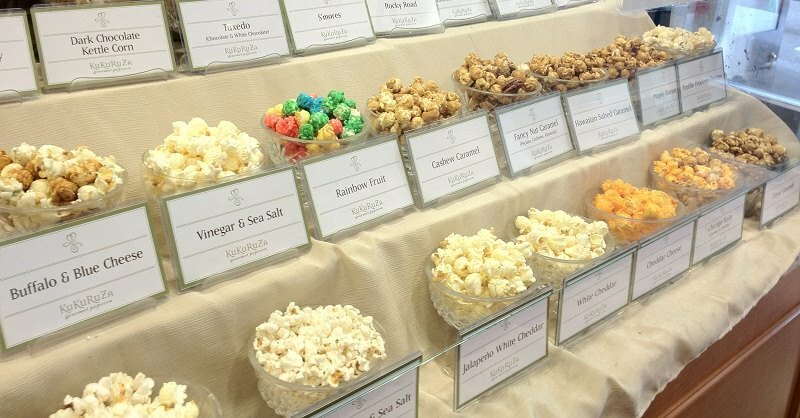 Always local at Cupcake Royale! To enter the giveaway: Simply leave a comment telling me which cupcake flavor (or flavors) you would choose if you were to win. 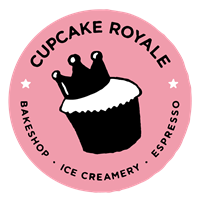 Please note: This giveaway is open to local readers only – you will need to pick up your cupcakes, within the month of August, at your neighborhood Cupcake Royale Cafe. This giveaway will end Midnight Pacific Time, Saturday, August 17 (my birthday!) I will choose one winner from the comments on my blog Sunday morning and will email the winner. Winner will have 24 hours to respond before I choose an alternate winner. 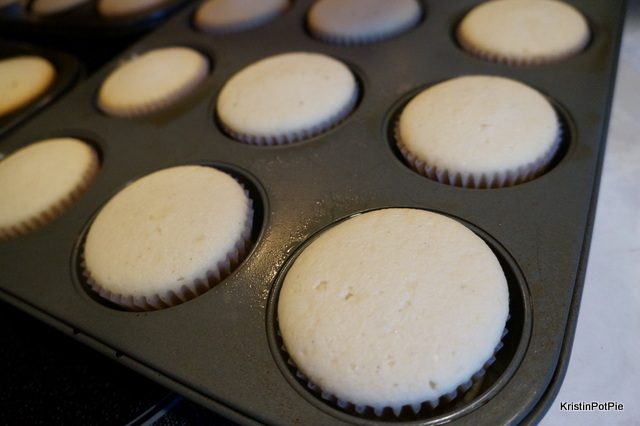 All photos provided by, and used with permission of, Cupcake Royale. 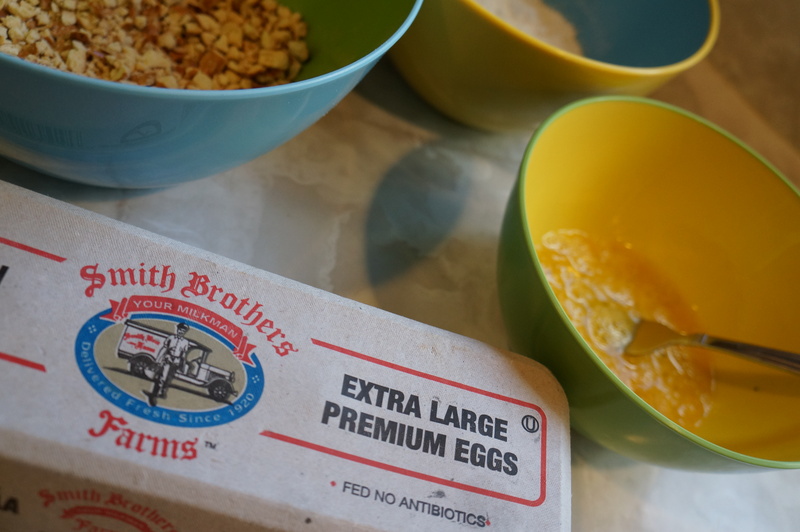 Smith Brothers Farms Giveaway Winner & a Prize for YOU! I am pleased to announce that Emilie Esther-Ann was the winner of the big $100 giveaway to Smith Brothers Farms! Congratulations Emilie! Hope you enjoy your farm fresh products delivered right to your doorstep! But that’s not all! 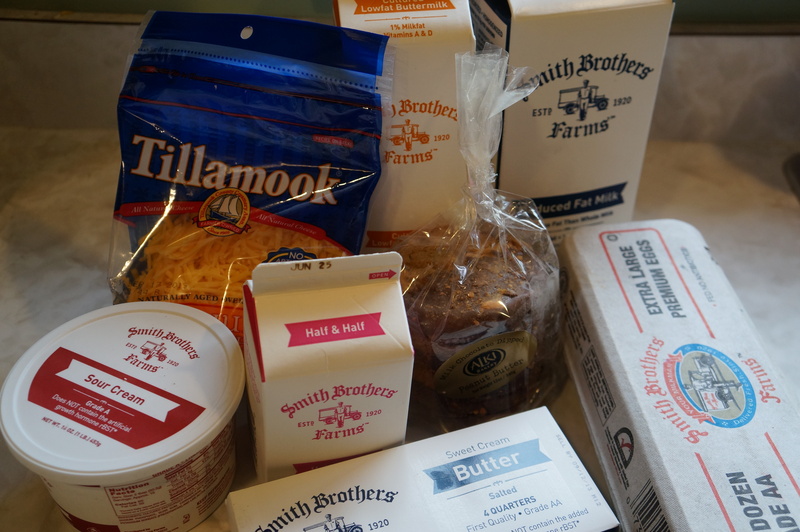 Even if you didn’t win, you will still want to try out the great service, and wonderful dairy products, from Smith Brothers Farms! To do that, they have generously given me a special code for my readers to get $10 off their first order! The promo code you will want to use is “Kristin”. 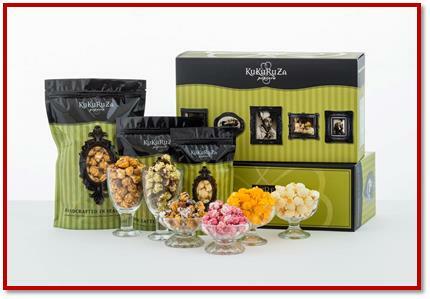 The offer is for $10 off your first order, for new customers only. You will need to be within their delivery area – no apartments or condos. 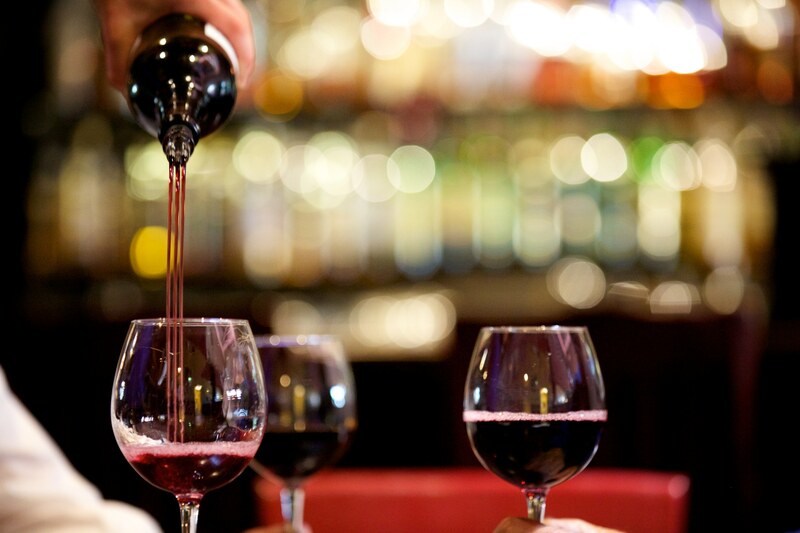 Just enter that promo code into the promo code box at the time of sign up – HERE. That is why I was so excited when the Smith Brothers Farms milkman delivered to my house last week. So convenient! And just look at all that dairy goodness fresh from the farm! With such wonderful customer service! 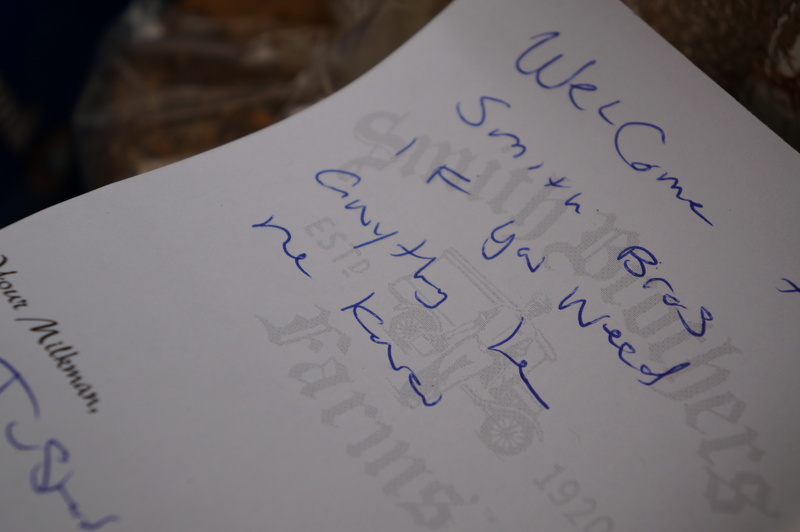 What a nice touch this personal note was left by our milkman, Justin. 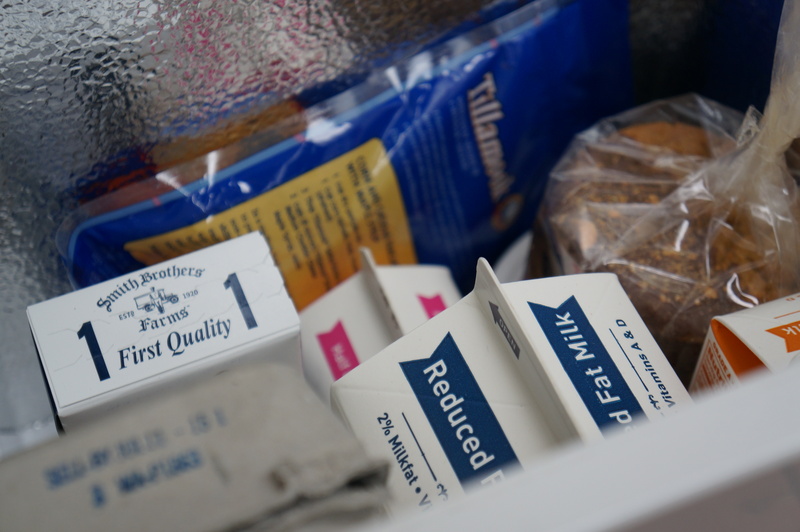 Smith Brothers Farms’ goal with their personalized milk delivery is to make it easier and more convenient for busy parents to feed their families healthy, fresh and nutritious food. They have been delivering farm-fresh milk since 1920 (more than 90 years! ), offer the freshest milk —from the farm to your fridge in 24 to 48 hours, and it has always been rBST (hormone) free. I must admit that I am not the best at meal planning and shopping ahead for everything that I need. And after a full day of work, the last thing I want to do is head to the store and THEN cook dinner. This salad is perfect for a warm summer evening. 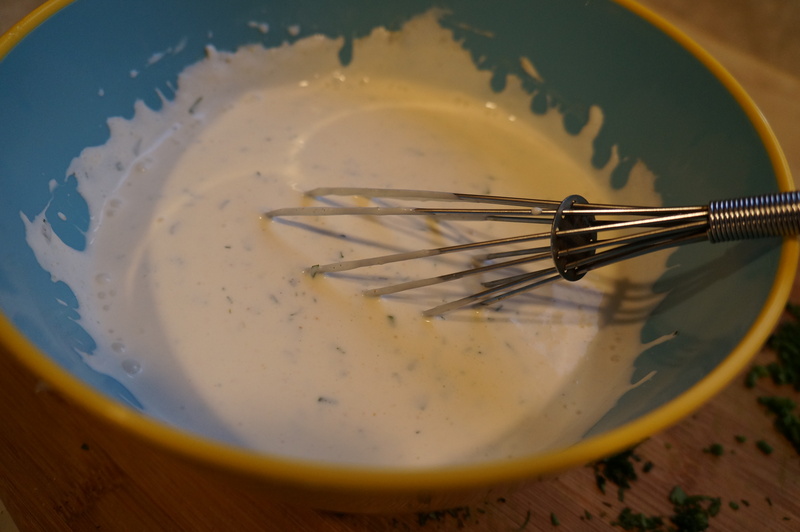 The chicken cooks up fast, and making this homemade ranch dressing from scratch is so much easier than you think. It takes just a few ingredients and some fresh herbs to make a salad dressing that will be a hit with your kids and is so much better than what you can find in any bottle. The buttermilk marinade makes the chicken nice and moist. Plus you can marinate according to how much time you have – the longer the chicken sits in this mixture, the more juicy it will turn out. You can mix all the ingredients up in the morning and stick the chicken in the marinade before you head to work, or you can let it sit in there for an hour when you get home. The best part is that this recipe is so versatile – I served the chicken separately with ranch on the side, for dipping, to my vegetable-averse 16 year old. Cheese (and the ranch dressing!) 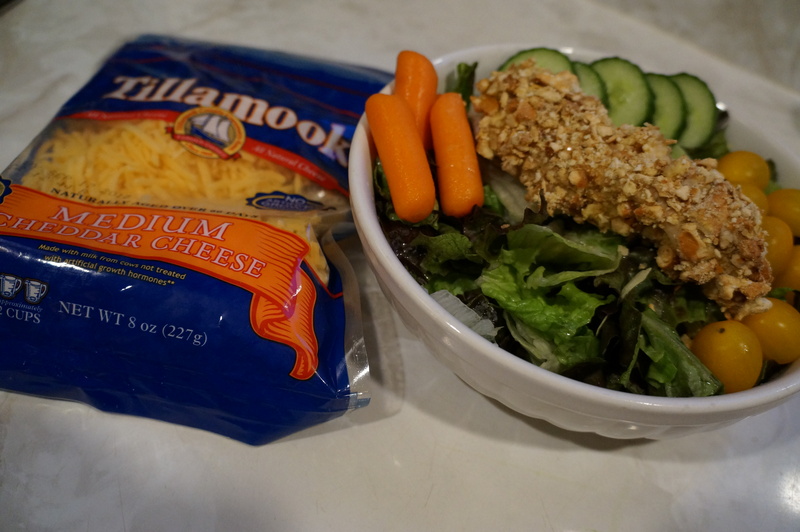 added to the salad helps to entice little ones who may claim to not like any green food. 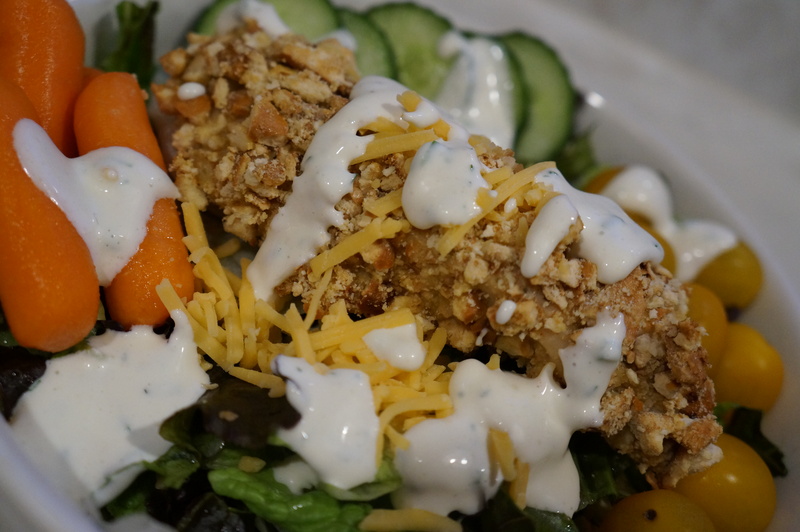 And the pretzel coating on the chicken means that you do not need to add croutons, since it provides just the right amount of crunch. Mix together all ingredients for the marinade. 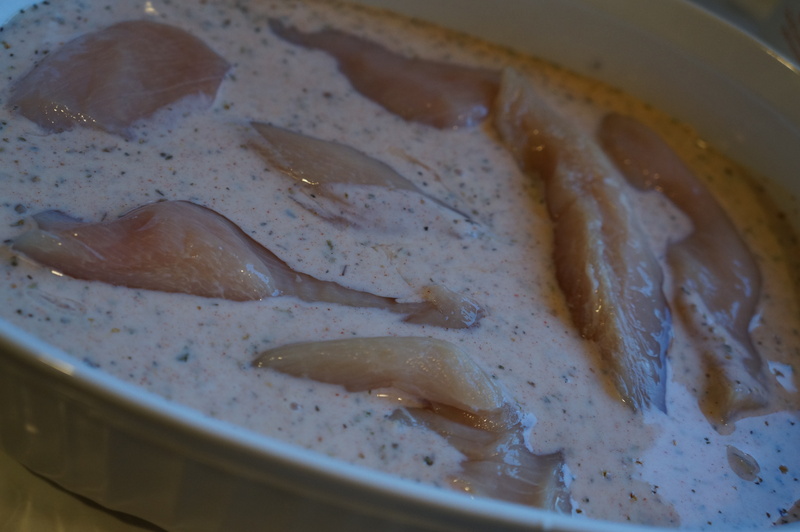 Place chicken strips or breasts in mixture, cover and marinade in the fridge for one to 8 hours. Preheat oven to 375 degrees. 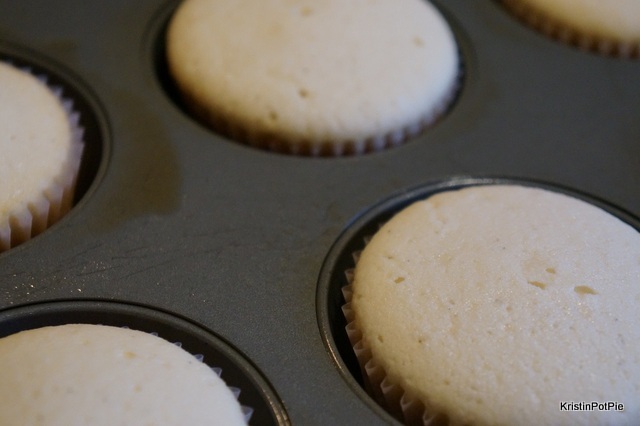 Coat nonstick baking pan with non-stick spray. Remove chicken from marinade and dry them by blotting with paper towels. 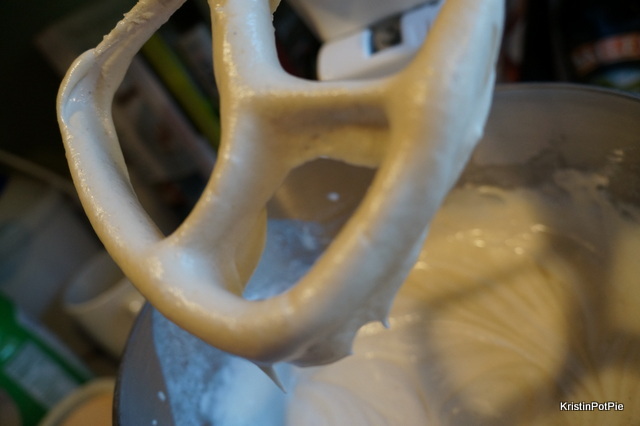 Dredge each piece of chicken in flour, then dip in eggs. 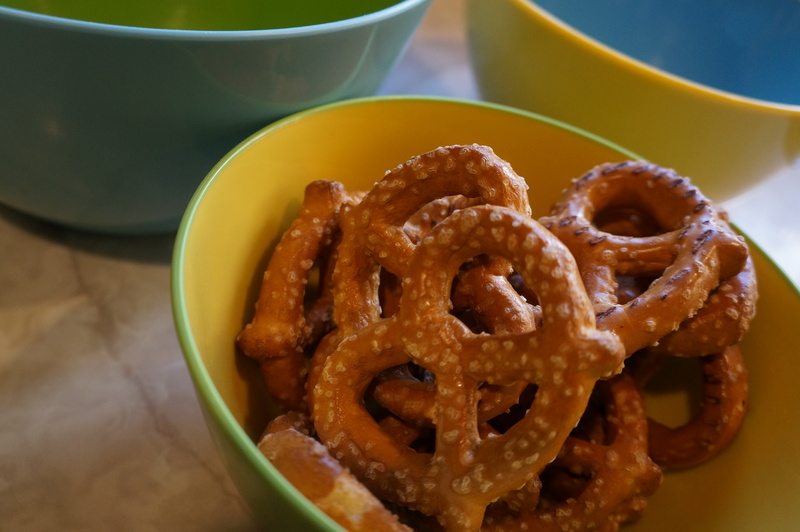 Place in crushed pretzels and roll as you push the pretzels on to coat. 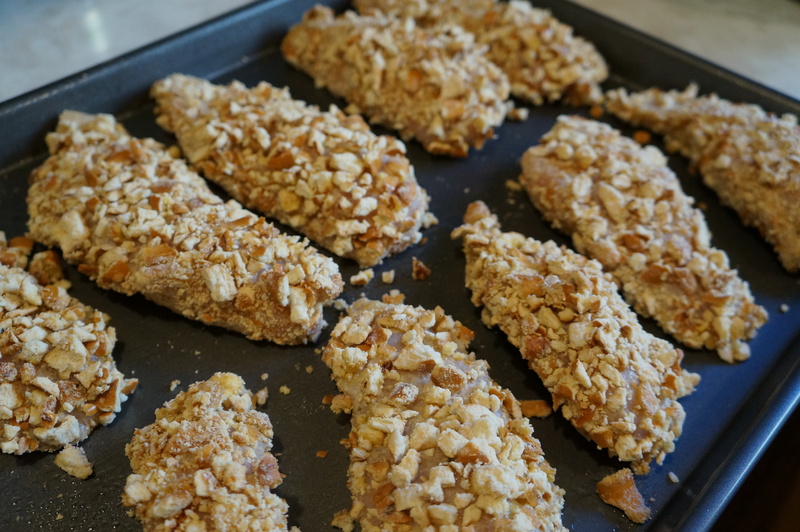 Carefully place coated chicken on baking pan and bake for 20-25 minutes. While the chicken is cooking, mix all ingredients for the salad dressing, except the milk, in a separate bowl. 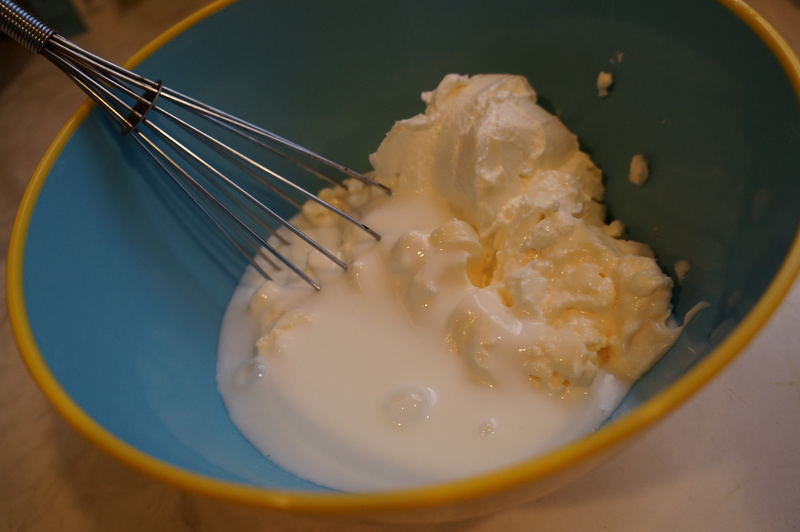 Add milk to thin the dressing to your desired consistency. Prepare individual bowls of salad using whatever greens and vegetables you like. My list is just a guideline! 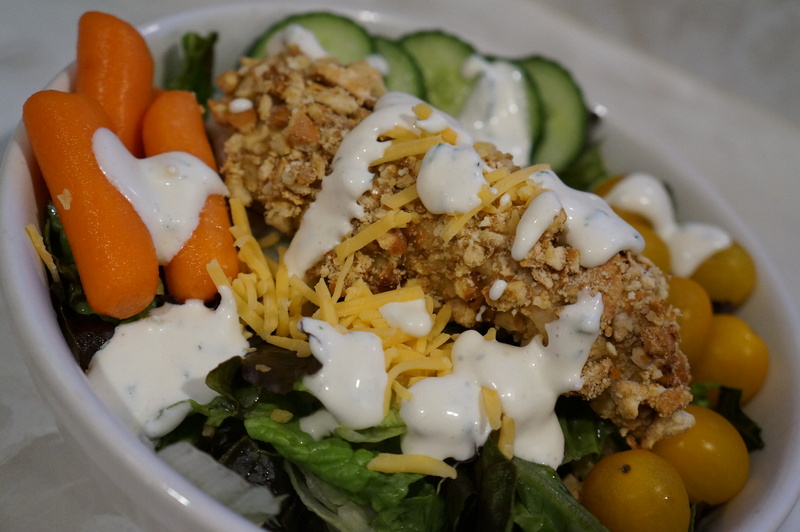 Top the salad with cheddar cheese, a warm piece of chicken and then drizzle with the ranch dressing. 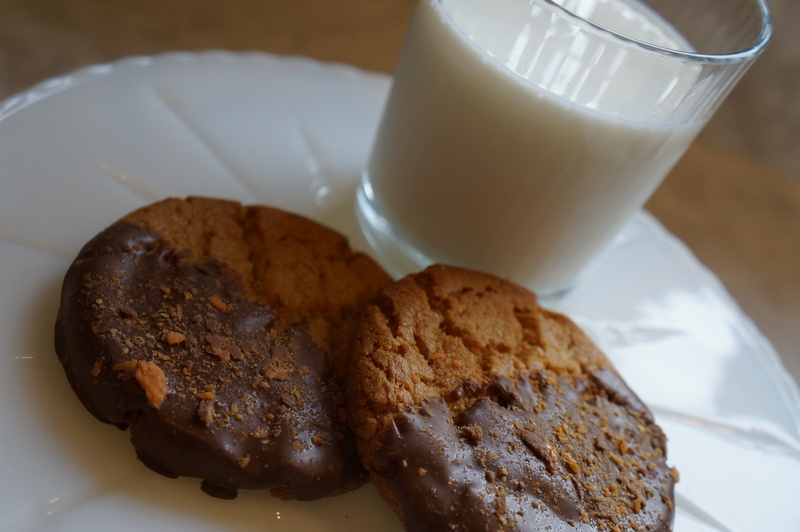 I recommend that you finish it off with some milk and cookies for dessert! 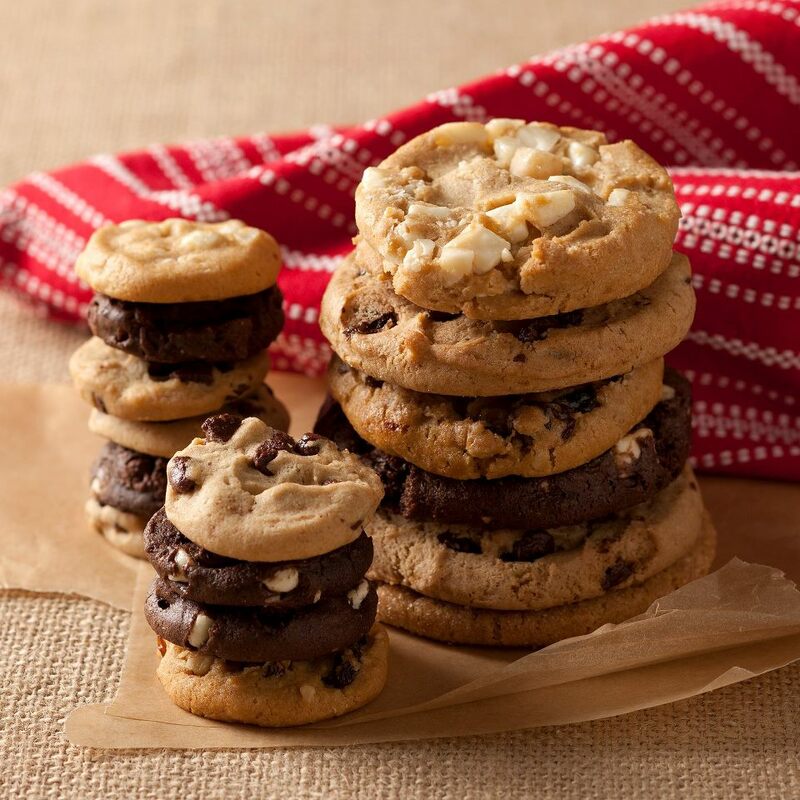 You will DIE for these cookies from Alki Bakery that is included in the Smith Brothers Farms delivery service! I am pleased that Smith Brothers Farms would like to offer one of my lucky readers the opportunity to try your own home delivery service. 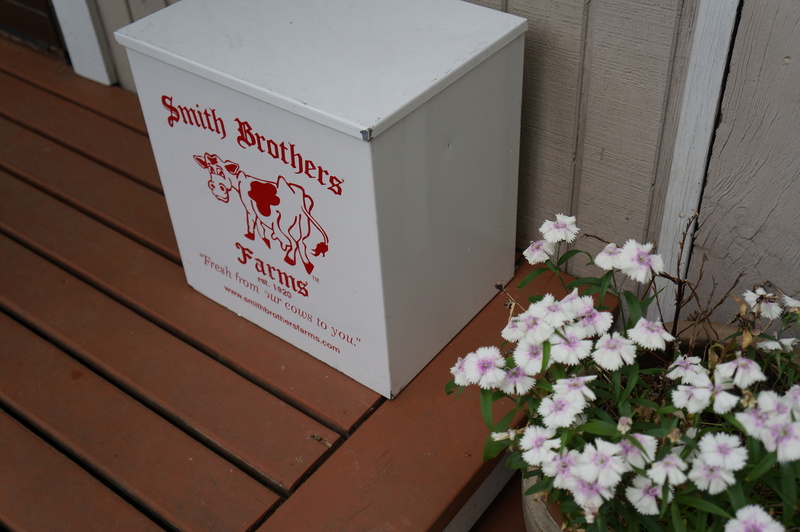 Here is your chance to win a $100 credit of Smith Bothers Farms home delivery product. To enter the giveaway: Simply leave a comment telling me what Smith Brothers Farms product, or products, you would choose for home delivery if you were to win. Please note: This giveaway is open to local readers only – you will need to be in Smith Brothers Farms delivery area to qualify for this giveaway. 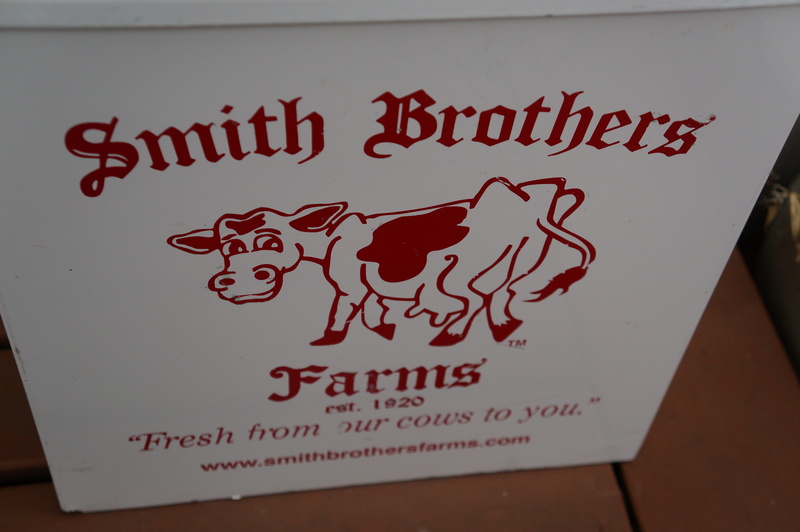 To find out if you’re in their service area, go to http://www.smithbrothersfarms.com/delivery/ scroll down to “Find out if you live on a delivery route” and enter your address. Also note: they are unable to deliver to apartments or condos. This giveaway will end Midnight Pacific Time, Sunday, June 30th. 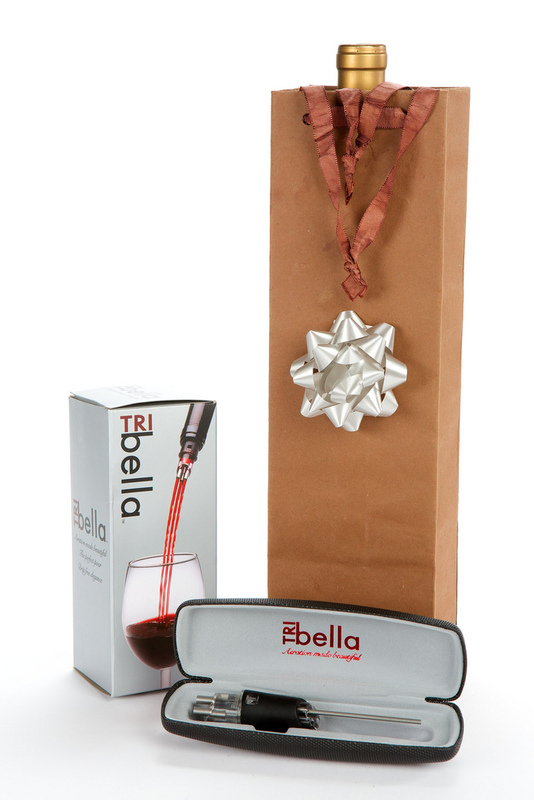 I will choose one winner from the comments on my blog Monday morning and will email the winner. Winner will have 24 hours to respond before I choose an alternate winner. 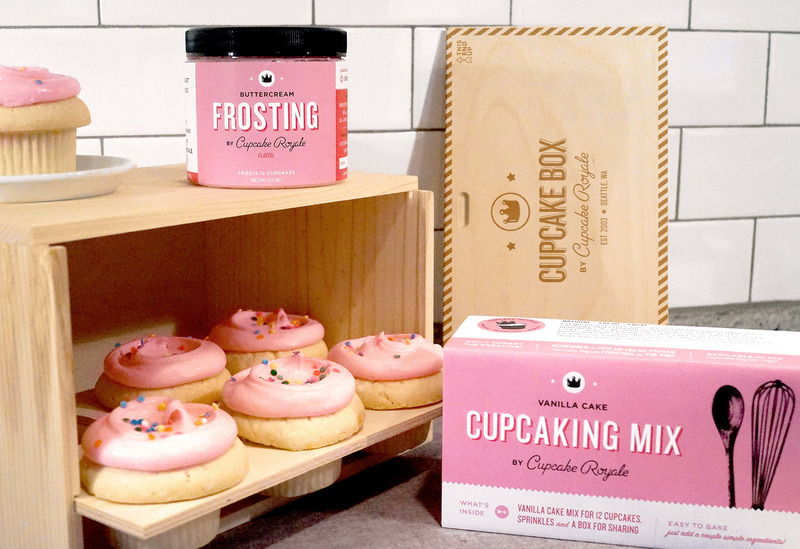 Flavors of the Season at Cupcake Royale – Giveaway! UPDATE: This giveaway is closed. The winner drawn is JD Northwest! Congratulations JD! 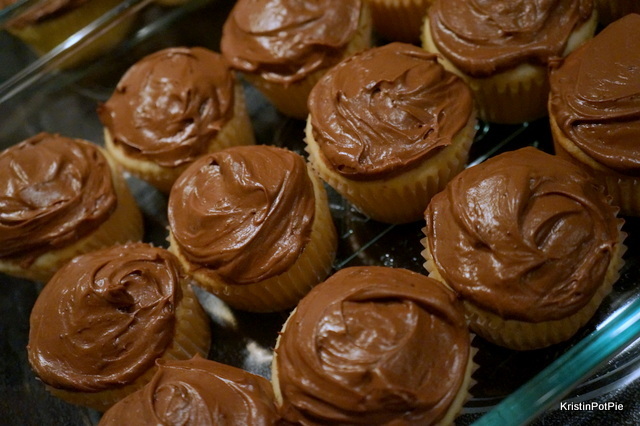 Hope you enjoy your delicious cupcakes! It is almost June and my favorite season of the year is about to start! Farmer’s market season! My neighborhood farmer’s market opens in a couple of weeks and I can hardly contain myself. Plump, juicy tomatoes, local green (and purple!) beans, fresh cut flowers for the table and, of course, strawberries that actually taste like strawberries are a few of the items I am so looking forward to. Cupcake Royale is like-minded in their love of this season. 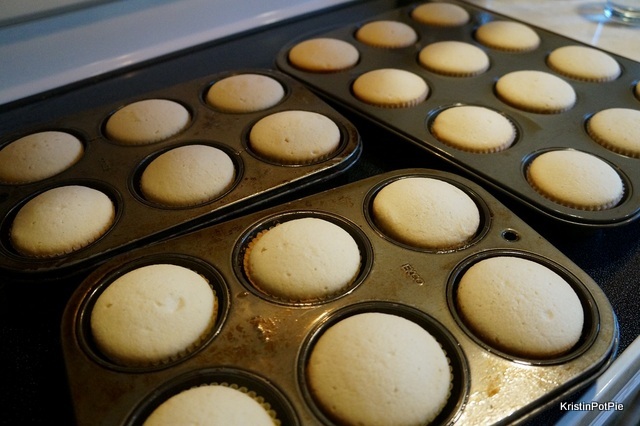 They will be using the freshest of the local markets’ fruits and whipping up cupcakes for their June menu to delight one and all, along with some other special flavors that will no-doubt be crowd-pleasers. 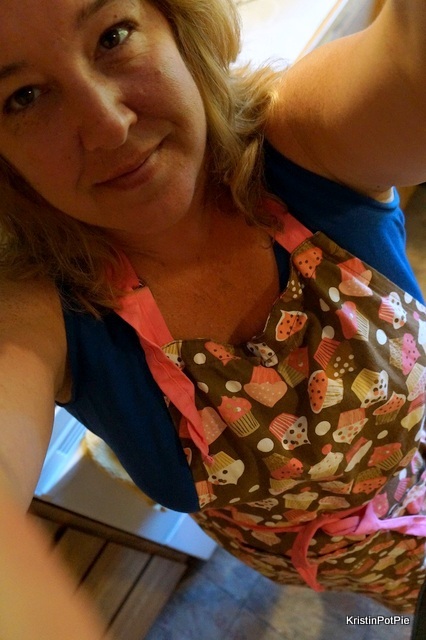 I am so excited that, to kick off June, they are partnering with KristinPotPie to give away a dozen cupcakes to one of my wonderful readers! Start the month off with the Strawberry 66. 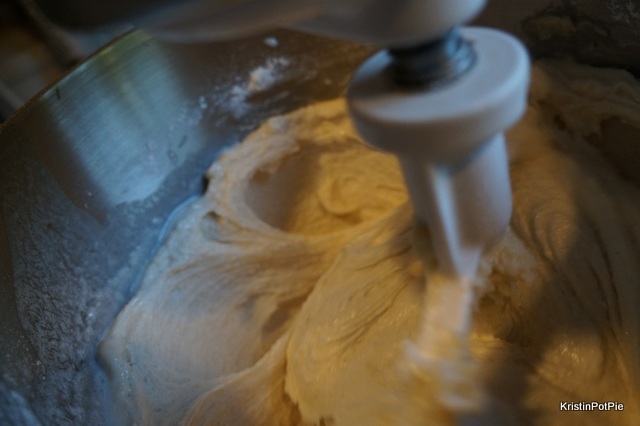 A rich vanilla bean butter cake swirled with juicy local strawberry buttercream. This little cake is made with 66 percent local ingredients, including hand-picked strawberries from Skagit Sun. I must not be the only one who loves those luscious little berries. 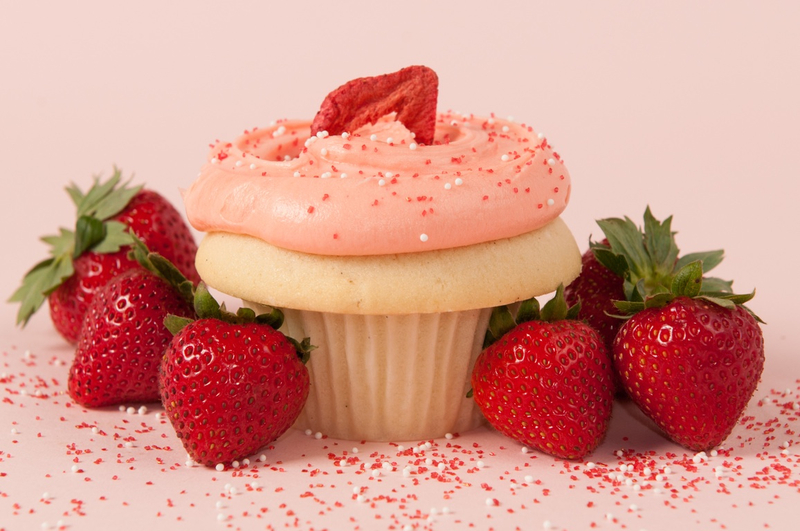 Strawberries are highlighted twice this month at Cupcake Royale! It starts with a vanilla cupcake, add a tangy rhubarb vanilla bean compote, homemade streusel tossed on top and baked to perfection! If that wasn’t enough, they add a generous swirl of fresh strawberry rhubarb buttercream and sprinkle with more crunchy streusel! And who doesn’t think of lemonade when they think of sunny days ahead? 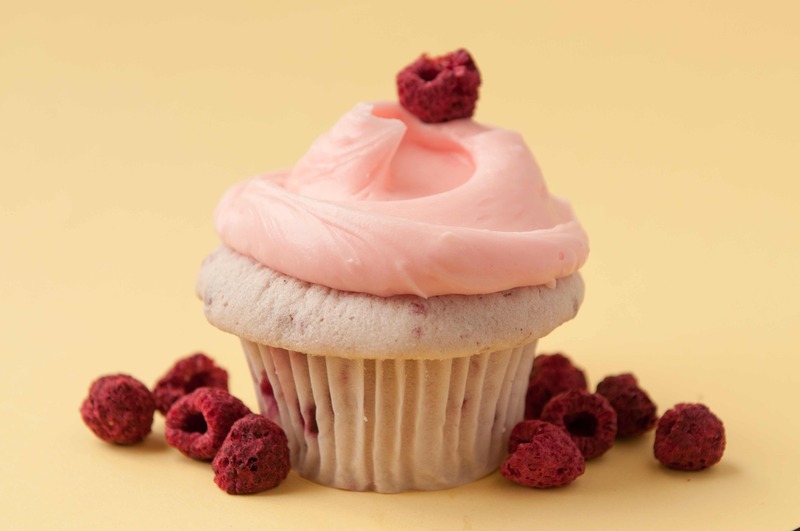 The Raspberry Lemonade will quench your thirst for summer – this delicious cupcake is made with local and fresh Skagit Sun raspberries folded into a vanilla bean cupcake topped with freshly squeezed lemon buttercream. So refreshing you could almost stick a straw in it. Is my grandma in the CR kitchen? 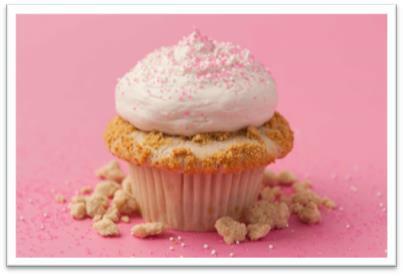 The Honey Snickerdoodle is a vanilla cupcake swirled with cinnamon and dredged with sugar cinnamon then baked with love. All this goodness frosted with a light rich Northwest honey buttercream topped with house-made snicker-doodle cookie crumbs. 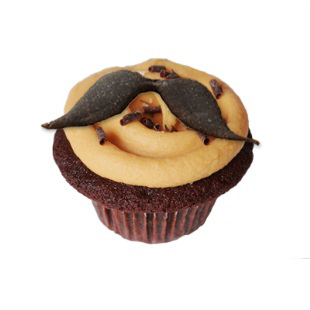 For a limited time only, from June 14 through Father’s Day, Sunday June 19, their award winning chocolate cake generously swirled with salted caramel buttercream, sprinkled with sea salt will be appropriately adorned – The Stash, will make an appearance at all Cupcake Royale cafes. Forget the Milk mustache- what’s hot is the cupcake mustache! And don’t forget Gay Pride this month. The Gay is back and as bold as ever as the Cupcake of the Month. Cupcake Royale has taken Plain Jane shopping for a new outfit! Nothing plain about the GAY! 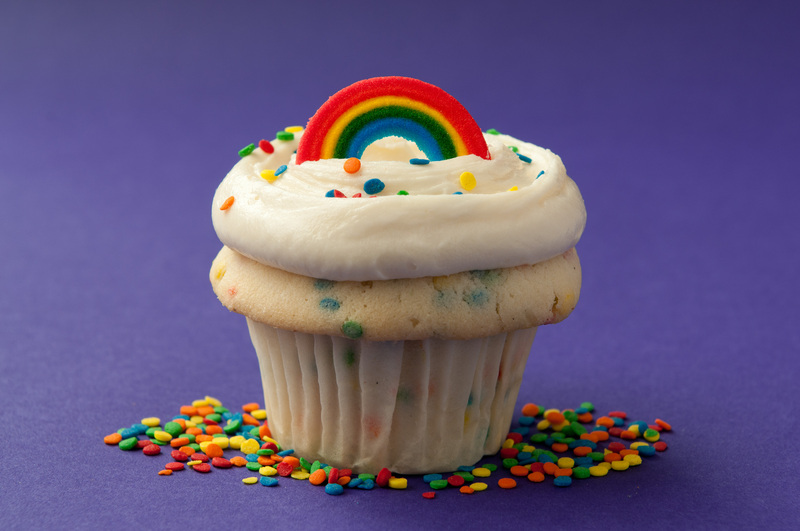 The vanilla cupcake is sprinkled with rainbow goodness and kissed with some rich vanilla buttercream. Of course, it is crowned with a rainbow! Please note: This giveaway is open to local readers only – you will need to pick up your cupcakes at your neighborhood Cupcake Royale Cafe. This giveaway will end Midnight Pacific Time, Tuesday, June 4. I will choose one winner from the comments on my blog Wednesday morning and will email the winner. Winner will have 24 hours to respond before I choose an alternate winner.